Casio for 25 years refines his concussion-proof collection, proving that the watch is a delicate product, which need to be careful, but a reliable companion more than the owner. In addition to the basic features which are G-Shocki, GW-9200 is the first model with 6-band radio-controlled (2 x EU, USA, 2 x Japan, China). This feature makes the Wave Ceptor watches are the most accurate timepieces in the world. Standard atomic clock synchronization ensures that all go to an accuracy of one second in a million years. Riseman also has a green power does not require battery replacement, because the internal battery is recharged by solar panels – Tough Solar. But the biggest variation in relation to other models from the collection of G-Shock is a dual sensor. Riseman has a thermometer and a pressure gauge, which also allows you to read altitude (altimeter). In addition to these functions, GW-9200 has an automatic backlight, stopwatch with an accuracy of 1/100 second, timer, 5 alarms, and world time. 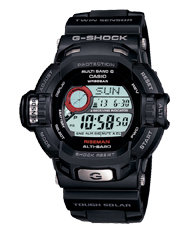 Just like all other modern G-Shocki also has water resistance to 20 atmospheres.